"This house simply blew us away." The Swann Wind Bridge House is in a wooded setting on an outcropping in the bend of a small creek. An attached footbridge crosses the creek and, together with the house, anchors a pedestrian cobblestone road lined with houses that is inspired by the character of English hamlets in the Cotswolds. It is designed for ecologically conscious clients with a focus on community and an active lifestyle. The house’s design serves to reinforce the pedestrian scale of the community while at the same time offering the full range of homeowner experiences on a small 1/10th acre lot. 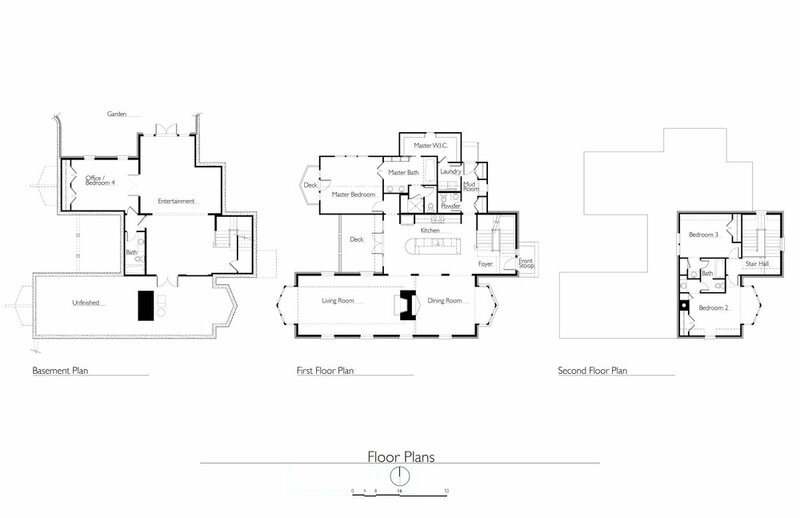 Consequentially the design provides efficient space-planning with generous details such as an open stair hall, 12’ vaulted ceilings, numerous large windows, and tranquil outdoor spaces. and narrow building masses. The expression is intentionally simple and the material palate is minimalist and balanced. The challenge of meeting the critical need for privacy within such a close-knit community (including a public right-of-way attached to the house itself) required significant thought. Layers of architectural massing run parallel to the bridge and serve as the primary public expression while shielding the more private parts of the house from public view. The main floor of the house is elevated 8’ from the bridge surface, giving occupants of the house a height advantage over the outside pedestrians and fostering a sense of pleasant separation. However, the living room functions like a traditional porch: occupants of the house can open the large windows and engage with the outside world, or they can close the windows and disassociate themselves from the nearby pedestrians.